The Indian Weightlifting Federation has been banned for the second time within seven months of coming out of a one-year suspension period and its embarrassed officials are unable to explain the utter humiliation. The International Weightlifting Federation, which has announced the ban on its website, is still undecided on the duration of suspension to be slapped on the national body. After playing hide and seek for nearly two months, the World Anti-Doping Agency finally managed to collect the samples of seven top Indian athletes, including a women athlete, during a surprise check conducted by the team at the National Institute of Sports late yesterday evening. 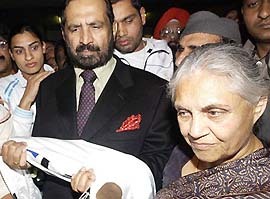 Delhi Chief Minister Sheila Dikshit and IOA President Suresh Kalmadi at the IGI airport on Tuesday night after they returned from Melbourne with the ceremonial flag of the Commonwealth Games. Delhi will host the next Commonwealth Games in 2010. Jyotsana, who made the country proud by her achievements in boxing and brought laurels for her home state Haryana, is a disillusioned person today. She could not find her name in the ‘Bhim Puraskar’ list announced by the Haryana Government for the sportspersons of repute. England cricketers today came in for severe criticism in the British media for their “kamikaze” batting and tame defeat to India in the first one-dayer in New Delhi. Important pointers have emerged about the two sides after the first one-dayer in New Delhi. Luck does become a factor when a pitch is as terrible as the one at Kotla but results are only incidental. It’s the mental make-up which is of greater significance. Dashing middle-order batsman Mahendra Singh Dhoni today said the Indian team was not receiving the kind of support sportspersons needed especially when they were going through a bad phase. Sharad Pawar talks about development of cricket infrastructure. Kumar Sangakkara scored 185 and spinner Muttiah Muralitharan claimed late wickets to push Sri Lanka towards victory in the first Test against Pakistan here today. Sharing in important stands with Mahela Jayawardene (82) and Thilan Samaraweera (64), Sangakkara propelled Sri Lanka to 448 for five in their second innings, setting up an unlikely 458-run victory target. The third Test between New Zealand and the West Indies fizzled out in the rain here today, leaving New Zealand convincing 2-0 winners in the three-match series. Chetan Anand advanced to the second round of men’s singles after a hard fought win over Kennevic Asuncion of Philippines at the Asian Badminton Championship in Johor Baru, Malaysia. Defending champion Viswanathan Anand was held to a draw by Grandmaster and his world championship second Peter Heine Nielsen of Denmark in the blindfold game of the 9th round of Amber Rapid and Blindfold Chess Tournament now in progress here. Former union minister and ex-Olympian Aslam Sher Khan today announced his resignation from the Indian Hockey Federation selection committee. The Indian Weightlifting Federation has been banned for the second time within seven months of coming out of a one-year suspension period and its embarrassed officials are unable to explain the utter humiliation. The International Weightlifting Federation (IWF), which has announced the ban on its website, is still undecided on the duration of suspension to be slapped on the national body. “Regrettably, four adverse analytical findings were reported on the occasion of doping controls carried out on the Indian national team members, this year. The Indian Weightlifting Federation has been suspended, the duration of which will be decided by the IWF Executive Board at the end of May,” according to the official IWF website. The IWF made it clear that B. Prameelavalli, who was dropped out of the Melbourne-bound Indian weightlifting team on the last minute, had also tested positive for a banned substance in the World Anti-doping Agency (WADA) test conducted in Patiala. “The four competitors concerned are Ms B. Prameela Valli, Sailaja Pujari, Edwin Raju and Tejinder Singh. Their provisional suspension will remain in force as long as all the applicable procedures have been completed,” it said. Indian Weightlifting Federation general secretary Balbir Singh Bhatia denied having received any official information regarding the same and when coaxed reacted angrily. “We have not received any official communication in this regard. We have come to know about it only through media,” was Bhatia’s answer. Asked what went wrong with lifters Edwin Raju and Tejinder Singh when they were cleared in the SAI’s departure tests for the just concluded Commonwealth Games in Melbourne, Bhatia gave a dubious statement saying he had no idea as their dope test reports from WADA as well as SAI were negative. “I have no idea. It seems they had tested positive by both WADA and SAI but the reports indicated otherwise. That is why we let them board the flight to Melbourne,” he said. When asked to elaborate on how could two reports show wrong results, he said, “You are asking me the questions, which I cannot answer. I have the reports with me, anyone can come and have a look at them. I am not a stupid to allow them to be in the team despite being in dope,” he said. Bhatia, who had earlier said that Prameelavalli had pulled out of the games due to some “family and personal reasons” admitted that Prameela was found positive in the WADA test. After playing hide and seek for nearly two months, the World Anti-Doping Agency (WADA) finally managed to collect the samples of seven top Indian athletes, including a women athlete, during a surprise check conducted by the team at the National Institute of Sports (NIS) late yesterday evening. The grapevine had it that the team would once again be visiting the institute today keeping the athletes on tenterhooks for the entire day. However, much to the relief of the athletes, these rumours just remained on paper as till today evening there was no trace of any of WADA officials. The samples, collected by the team yesterday under the leadership of the Bangalore-based WADA dope inspector Mr Sajid Hashmat, were those of 400m relay women runner Sagardeep Kaur, long jumpers Maha Singh and Amritpal Singh, shot putters Navpreet Singh and Kuldeep Mann, quarter miler Kuldeep Singh and member of the 400m relay team Srijith Sridharan. In fact, long jumper Amritpal Singh was earlier in the centre of a controversy when he suddenly withdrew from the Athens Olympics-bound squad last year owing to a ‘pulled muscle’. Out of these athletes, ace shot putter Navpreet was selected by the AFI for the Commonwealth Games but once he had reached Melbourne he was pulled out of the squad citing ‘illness’. The athlete after returning from Melbourne had arrived straight at the NIS a couple of days ago where the Indian camp for the Doha Asian games is in progress. Every year, the Haryana Government honours the sportspersons with this award, who win medals at national and international events. “I was sure of getting the award this year as I was the only girl of the state who won the gold medal in 3rd Asian Women Boxing Championship at Taiwan and a bronze in the World Women Boxing Championship in 2005. My name has also been nominated for the Arjuna Award”, said Jyotsana. Strengthening her claim, she said, “In 2004, my contemporary Meena Kumari got the award as she had won a silver medal in the Asian Championship and a bronze in the world championship whereas I bagged a gold medal in the Asian Championship and a bronze in the world championship”. Ruing the injustice meted out to her by the government, Jyotsana, who has won two gold medals in Asian Boxing Championships as well as two bronze in world championships, claimed this year again the awards were being given to the sportspersons whose achievements were less in comparison to her. “Just compare my achievements with the other sportspersons, whose names have been announced by the government for the awards, you would find me above them,” she said. But Haryana Sports Director V.S. Kundu refuted the claim of Jyotsana and said, “We give only five awards and she was on number six”. He disapproved of any wrongdoing in preparing merit. “Ill-judged sweeping by England helps India to clean up” screamed the headline in The Guardian while The Daily Telegraph said “Kamikaze England plummet to defeat.” Describing them as “Nut Crackers”, the largely circulated tabloid The Sun said: “England Chuck It Away In The First One-Dayer”. The Daily Telegraph said Andrew Flintoff will need all his inspirational powers to lift his team-mates for the second match after yesterday’s debacle described as “an astonishing collapse that must rate as one of the worst in a long line of England one-day horrors. “Few teams do kamikaze as well as England when the mood is upon them. Yesterday was a lesson in how to lose a game when the opposition had all but given up hope. At 117 for three, with just 87 runs needed from fully 30 overs, the match was sewn up as tight as Shane Warne’s new hairdo. “Kevin Pietersen started the rot when he aimed a slog-sweep at Yuvraj Singh’s part-time left-arm spin and holed out at deep midwicket. But it was the next three dismissals, unfolding with horrible inexorability, that halted England’s innings as surely as an iceberg ripping open an ocean liner.” The Guardian said: “First Lahore, then Mohali, now Delhi. The list of sub-continental cities to have staged an official inquiry into English crimes against the sweep grew yesterday. And once again there was no need to call for Lord Hutton.” “To throw away a 1-0 lead in a seven-match series by playing the shot that in recent months has dared not speak its name might have made even Duncan Fletcher wonder about its merit. New Delhi: Attacking England batsman Kevin Pietersen displayed cautious aggression when he defended the criticism from the media regarding his sweep shot, which cost England the first ODI against India, saying that its was a right shot played at the wrong time. “Yesterday was not a silly shot,” Pietersen told BBC Five Live. “Most days I’d probably hit it out of the ground but in terms of the situation, needing three (runs per over) it looks like a lot worse shot that I normally play,” he admitted. England were 117 for three when Pietersen got out and crashed to 164 all out after his dismissal. “It was a full toss in a scoring area where I score a lot of runs for England and it was just unfortunate I hit it down to a fielder,” he said. 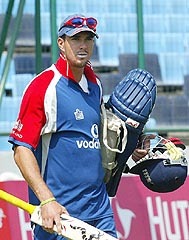 Pietersen said though he was disappointed with the loss but believed there was time to make amends. “I don’t feel happy waking up knowing we were so close and we lost the game. But I’m not going to punish myself because I know that I’m playing really well.” “We’re looking forward to the next six games because we know the Indian team can be beaten,” he said. Meanwhile, the British media lambasted the team for losing a golden opportunity to gain an upperhand over the hosts and blamed the defeat on the batsmen, who played sweep shots off the bowling of Harbhajan Singh and literally threw their wickets. 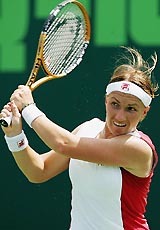 The Times said English were swept away by Harbhajan playing the “slog-sweep”. The daily said the tourists collapse was “reckless”. The Daily Telegraph said the performance was the “worst in a long line of England one-day horrors” and Flintoff has the huge task to motivate the side ahead of the second one-dayer in Faridabad. The Mirror in a report headlined “Indians sweep home” described England’s chase a wasted effort and called on Flintoff to take the blame for the loss. England had no business to lose from the overwhelming comfort of 117 for 3, chasing 204 in the afternoon. They lost next six wickets for 25 runs and the final seven for 47 from 18-odd overs. The last pair came together in the 32nd over which was an absurd equation between required runs and the overs left with the last men standing. Juvenile is the first expression which comes to mind. India, on the other hand, was battling overwhelming odds. They were fresh from the Mumbai mauling and were asked to bat first which they have patently sought to avoid in recent past. They didn’t have Sachin Tendulkar or Anil Kumble and Virender Sehwag is in a reversal mode. They were 80 for 5 and yet the lower order resisted. The back-up heroes were neither from the top order nor terribly experienced. In the afternoon, India kept finding its bowling and fielding saviours. The twin strike of Irfan Pathan almost didn’t matter as England recovered. But Rahul Dravid was inspirational as skipper and some of the catching was as sublime as it was ridiculously inept in Mumbai. The irony is complete. England as a Test side keeps moving upwards while its stock in one-day cricket is slipping everyday. India is a side reborn in one-day cricket while in Tests, it’s almost on a life-support system. Five of England batsmen were out attempting a sweep or toying with the idea at a critical moment of decision, as was the case with Geraint Jones. Clearly England think of it as a ploy to counter Indian spinners and upset the field. They were adequate with their defensive methods in Tests but in the fast-paced word of one-dayers, you need to score runs as well and hence the reliance on this method. They are still some way from leaving the crease to slow tweakers. It’s a skill which can’t be taught overnight. Dhoni refused to elaborate but hinted at the boorish crowd behaviour in the Test match against England at Mumbai last week. “We are not getting the support we want from our fans, particularly when things are not going well for us,” the swashbuckler from Ranchi said. “I can understand if we are playing abroad, the support is going to be less for us there. “When we are playing in India, we expect good support for us. It helps us if you back us strongly,” the 24-year old said at a function to felicitate him here. “I don’t want to be specific but you know what happened in Mumbai and here (in the first one-dayer yesterday),” he added. Dhoni got out to a rash shot in India’s second innings in Mumbai as the hosts capitulated to a 212-run defeat while the Delhi crowd jeered the batsmen on their dismissals in the first one-dayer yesterday. Pakistan were 89 for two at the close of the fourth day. 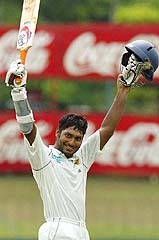 The 28-year-old Sangakkara, who became the seventh Sri Lankan to score more than 4,000 Test runs yesterday, cracked 23 boundaries during a ninth Test century that spanned seven-and-a-half hours. Sri Lanka’s second innings run spree, on a pitch that grew increasingly placid for the pace bowlers but was offering turn for the spinners, left Pakistan needing to bat for more than four sessions to secure a draw. The tourists’ openers, drained after two long days fielding in Colombo's wet heat, started brightly with a 59-run stand either side of the tea interval. Muralitharan, bowling unchanged for 14 overs after an initial attack with the new ball, struck in the final hour, however, to leave Pakistan precariously placed at the close. Imran Farhat (34) was the first to depart as he edged to slip and then Younis Khan (eight) was cleaned bowled by a big off break as he tried to cut through the off side. Shoaib Malik, dropped on 14 by Sangakkara behind the stumps, finished unbeaten on 30 and Faisal Iqbal was nine not out at stumps. Fall of wickets: 1-5, 2-127, 3-285, 4-429, 5-438. Bowling: Asif 23-4-71-2, Gul 20-1-73-0, Kaneria 36-5-138-1, Malik 15-2-48-1, Afridi 21-0-57-1, Razzaq 12-1-43-0, Farhat 1-0-2-0. Fall of wickets: 1-59, 2-71. The rain washed out the one chance the West Indies had to make amends for a dismal tour, after they were beaten 1-4 in the earlier one-day series. But although they made their best start of the tour, reaching 256 for four in the rain-disrupted first two days, they could go no further with the remaining three days all washed out. The draw snaps an eight-Test losing streak for the West Indies who head home to prepare for a seven-match one-day series against Zimbabwe before hosting India for five one-dayers and four Tests. New Zealand take heart from a series win, and the second Test victory gave them five wins in succession for the first time in the nation's cricketing history. An added bonus for New Zealand has been the rain, which has allowed their bowlers to take a breather before embarking on what should be a much tougher Test series in South Africa. Chetan, bronze medallist in the Commonwealth Games, notched up a 26-24, 20-22, 21-9, win against Asuncion to move to the second round, according to information received here. In the women’s singles, Saina Nehwal and Trupti Murgunde also moved to the second round with convincing wins. Saina, who was in sparkling form at the Commonwealth Games, thrashed Lydia Cheah of Malaysia 21-9, 21-18 while Trupti Murgunde beat Xing Aiying of Singapore 21-12, 23-21. However, Anand Pawar and B.R. Meenakshi bowed out of the competition, losing their first round men’s and women’s singles matches respectively. Pawar lost 14-21, 17-21 to Yanbo Qiu of China while Meenakshi gave up 14-21, 12-21 to Kaori Mori of Japan. Former union minister and ex-Olympian Aslam Sher Khan today announced his resignation from the Indian Hockey Federation (IHF) selection committee. “I dispatched my resignation to the IHF’s honorary secretary today. The committee indulges in discrimination and highhandedness while selecting players. These erroneous policies are leading to a constant decline in national hockey,” he told reporters here. Khan said it was unfortunate that a country that had earned global recognition in hockey is performing badly in its national game.